NASA’s Dr Tim Hall gives his prognosis for the rest of the 2016 Atlantic hurricane season and asks whether the frequency of hurricanes at the end of the season is affected by how things started. Hurricane Hermine made landfall on the Big Bend region of Florida at Category-1 intensity September 2, marking the first hurricane landfall on Florida since 2005. Wind and flooding caused widespread power outages, and thousands were forced to evacuate their homes. Storm surge ravaged the coast throughout the region, peaking at 1.8m on Cedar Key. 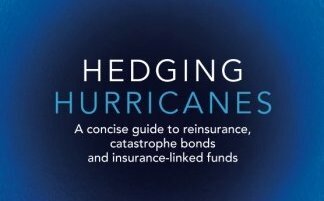 But the impact on the reinsurance and ILS market is likely to be minimal - RMS have estimated less than $400m of insured losses. Overall, however, the 2016 North Atlantic hurricane season has been middling, despite pre-season forecasts (including our own) for above average activity. The climatological date of peak activity, September 10, is well past. Basin-wide counts through September 21 are 12 named storms, 4 hurricanes, and 1 major hurricane, compared to 1950-2013 September-21 averages of 7.3, 3.9, and 1.8, respectively. The single catagory 1+ US landfall (Hermine) is spot on the mean 1950-2013 pre-September 21 rate of 1.0. What are the prospects for the rest of the season? Currently El Nino/Southern Oscillation (ENSO) in a modest La Nina state, and North Atlantic, Caribbean and Gulf sea surface temperatures (SST) are above average, similar to pre-season projections. These factors continue to favor enhanced activity. Using current ENSO and SST my stochastic track model estimates post-September-21 US landfall rates to be 28% above the 1950-2013 mean of 0.47, very similar to my pre-season forecast. 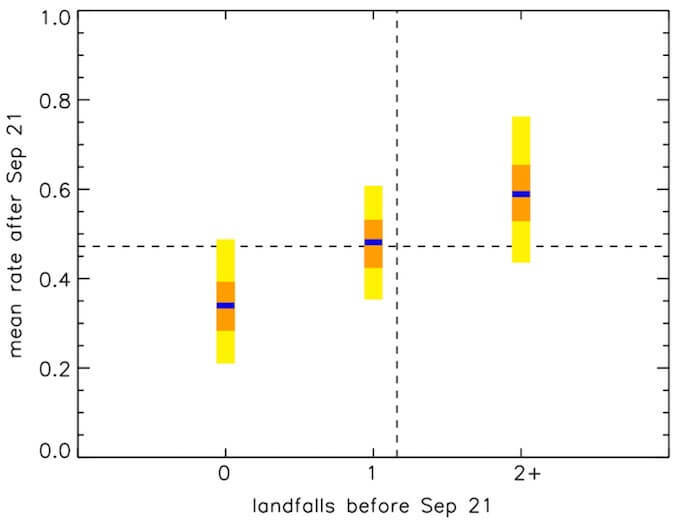 Figure 1: Mean US Cat1+ landfall rates after September 21 conditioned on landfall counts before September 21, based on 1851-2013 HURDAT. Blue indicates the best estimate, orange the inner 50% uncertainty from a bootstrap analysis, and yellow the inner 90%. The horizontal dashed line is the unconditional post-September 21 mean rate, and the vertical dashed line is the pre-Sep 21 mean rate. It’s interesting to address the question in a way that avoids complex models. Based solely on landfalls to date, what can we say about landfalls for the remainder of the season? Does an active first part of the season imply an active second part? Figure 1 indicates that the answer is yes, but just barely. Over the period 1851-2014, I computed the mean Cat1+ US landfall rate after September 21 conditioned on there being 0, 1, or 2+ landfalls before September 21. The mean post-September 21 rate does indeed increase from 0.34 to 0.48 to 0.59 for pre-September 21 counts of 0, 1, and +2, respectively. Presumably, the physical factors influencing hurricanes have memory through the season. But the uncertainty (bootstrap analysis) is large, and the changes are only marginally significant compared to the unconditioned post-September 21 mean rate of 0.47. By this method, the current single 2016 landfall, close to the long-term mean, implies another half a landfall for the rest of the season, also close to the long-term mean.